When a trait is recessive, an individual must have two copies of a recessive allele to express the trait. Recessive alleles are denoted by a lowercase letter (a versus A). Only individuals with an aa genotype will express a recessive trait; therefore, offspring must receive one recessive allele from each parent to exhibit a recessive trait. One example of a recessive inherited trait is a smooth chin, as opposed to a dominant cleft chin. Let (S) represent the dominant allele, and (s) represent the recessive allele. Only (ss) individuals will express a smooth chin. To determine the probability of inheritance of a smooth chin (or any other recessive trait), the genotypes of the parents must be considered. If one parent is heterozygous (Ss) and the other is homozygous recessive (ss), then half of their offspring will have a smooth chin. In other words, any of the offspring will have a fifty percent chance of having a smooth chin. 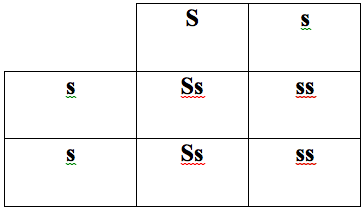 A Punnett square can be used to determine all possible genotypic combinations in the parents. This is a pedigree depicting recessive inheritance. Unaffected parents can produce affected offspring if both parents are carriers (heterozygous) for the trait being tracked in the pedigree. Recessive traits are typically not expressed in every generation. Lastly, males and females are equally likely to express a recessively inherited trait. 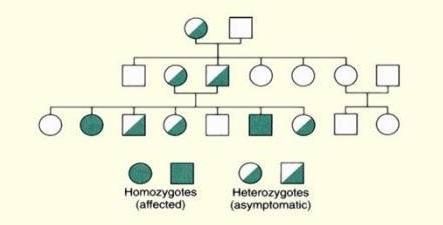 In this pedigree, carriers (heterozygotes) are indicated with half-shaded circles or squares while homozygotes are completely shaded.